Combining beautiful panoramas, a stylish setting and personalised service, Hôtel Mariosa is a superb hotel on the southern coast of Corsica. 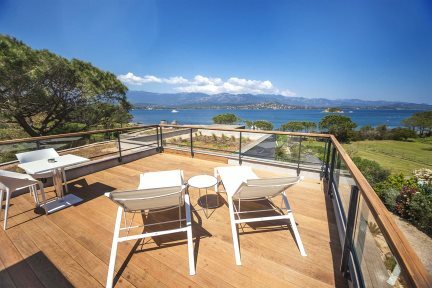 This hotel enjoys a backdrop of the glamorous gulf of Porto Vecchio and the soaring peaks of the Bavella mountains, benefiting from easy access to the nearby town of Porto Vecchio bustling with boutiques, restaurants and nightlife. The design of the hotel is contemporary and uber-stylish – here it’s all about chilled-out vibe, living-in-style comforts and good food. 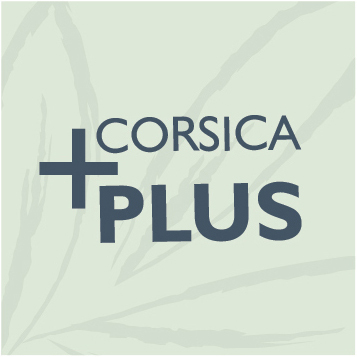 You’ll find plush sunbeds around the pool for you to lazily lounge around and soak up the Corsican sunshine, a fantastic restaurant with excellent buffet breakfasts, and a private yacht for days out exploring the southern coastline. All the rooms are a good-size, clean-cut in style and are decorated in neutral tones to give them a light and comfortable feel. The ground floor rooms have a private terrace with beautiful garden views, and first-floor rooms boast partial sea views from their small balcony. It's worth noting that they all come with a free standing bathtub, whilst the toilet and shower room sit separately behind a frosted glass door. So whether you’re looking to spend your days exploring the best beaches of the south or simply relax on a romantic escape, Hôtel Mariosa is sure to be the perfect hand-picked hotel for you. Heated swimming pool (15m x 4.5m, max depth 1.8m), restaurant, bar, parking. Skippered yacht (half or full day), water taxi to Porto Vecchio and massages are bookable and payable locally. Open bath area, separate shower and wc, television, telephone, safe, air-conditioning, Wi-Fi. Ground floor rooms with garden views and terrace. 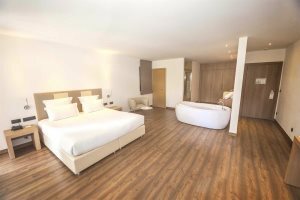 This 26m² bedroom has a 18m² of garden, 180 x 200 bed, air-conditioning, open-plan bathroom, television, telephone, safe, mini-bar, and Wi-Fi. First-floor rooms with partial sea views and small balcony. 26m² room with 180 x 200 bed, air-conditioning, open-plan bathroom, television, telephone, safe and mini-bar and Wi-Fi. First-floor rooms with sea views. This 32m² bedroom has 180 x 200 bed, air-conditioning, open-plan bath, television, telephone, safe, minibar and Wi-Fi. Please note these rooms do not have a balcony or terrace. 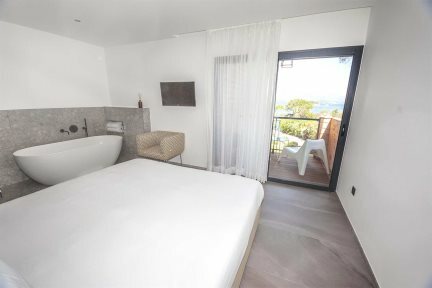 This 26m² bedroom enjoys a privileged view of the Gulf of Porto Vecchio and Ziglione island. 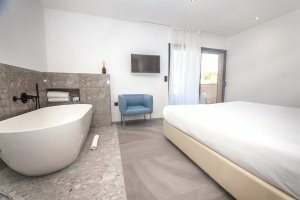 With with 180 x 200 bed, There is a covered terrace of 26m², air-conditioning, open plan bath, television, telephone, safe, minibar, and Wi-Fi.